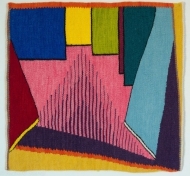 I have been, am and will be weaving a series of tapestries whose central theme is that of women who are practitioners of the textile arts and processes. Through their practice these women influence the lives (and deaths) of others, and, at times, are mistresses of their own fate. They are heroines of the past – of ancient myth, of historical past and of literary fantasy. Ovid, in the Metamorphoses, writes of the weaving contest between Minerva and Arachne – a story that ends so badly for the unfortunate spinner of webs. From Ovid we also learn the tragic tale of Philomela, raped by Tereus. When her tongue is cut out so that she cannot tell the tale, she condemns her brother-in-law by embroidering her silent testimony. The Moirae, of the ancient Greek pantheon, are the “Apportioners,” better known as the Three Fates – Clotho, Lachesis and Atropos. The youngest sister, Clotho, the “spinner,” plies out the thread of human life. Lachesis, the “measurer,” takes up the thread and draws it out within the span of her arms. Atropos, the eldest, the “inevitable,” cuts the thread with her shears at the moment of human mortality. The Valkyries of Norse myth are identified as weavers in the 13th Century Icelandic Saga of Burnt Njal. Theirs is a gruesome loom, warp-weighted with the skulls of those who have died on the battlefield. The stretched warp, blood red, is made of the entrails of the fallen soldiers. Their arrows become weaving shuttles for the weird sisters, and the weft for the web is the flayed skin of cold, blue corpses. In the Apocryphal Gospel of James we read of the infancy and early life of the Virgin Mary. The text tells us that as a young woman Mary is spinning scarlet and purple yarn to be woven into temple cloth when the Angel Gabriel comes to announce that she is to be the Mother of God. So, too, her cousin, Elizabeth, also pregnant, is spinning yarn when Mary arrives to stay during the latter stages of her pregnancy. A parallel annunciation occurs when John the Baptist leaps in the womb of Elizabeth as he recognizes his Lord and Saviour, Jesus, resident within Mary’s belly. Alfred, Lord Tennyson’s Lady of Shalott is cursed to sit at her loom and weave tapestries of the images that appear reflected in a hanging mirror. The Lady’s love of the handsome Lancelot is of such overwhelming power that it draws her from the loom to gaze out the window of her small bower. For the first time in her life she sees the outside world clearly without the shadowy mediation of the mirror. This defiant act invokes the curse, and the Lady of Shalott seals her own doom. While a variety of literary works form the conceptual basis for my series of tapestries, their physical realization also involves both aesthetic and formal artistic considerations. The tapestries are all relatively small; each is less than one square metre. The imagery in the tapestry is layered: the lower layer forms an abstracted background upon which the upper imagery, a linear illustration or decorative pattern, appears to float. 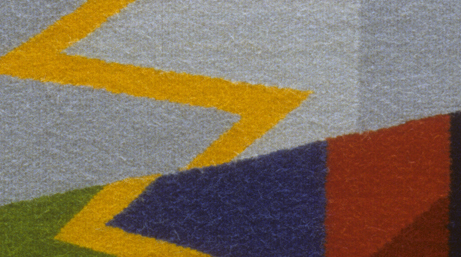 This layered quality is enhanced by weaving the background in flat, light-absorbing wool and the “floating” element in shiny, mercerized cotton which reflects light. The abstracted background is derived from images of draped clothing whose highlights, folds and shadows are formed as the cloth falls naturally over the limbs of a female body. The images of these literary heroines and their clothing are borrowed from well-known artworks – paintings, tapestries, sculptures, and photographs. I focus on only a small area of the imaged cloth, enlarging and embellishing the detail until it fills the surface area of my cartoon. The excessive magnification enforces the abstraction of the source material. The overlying patterns and illustrations are my own creation. 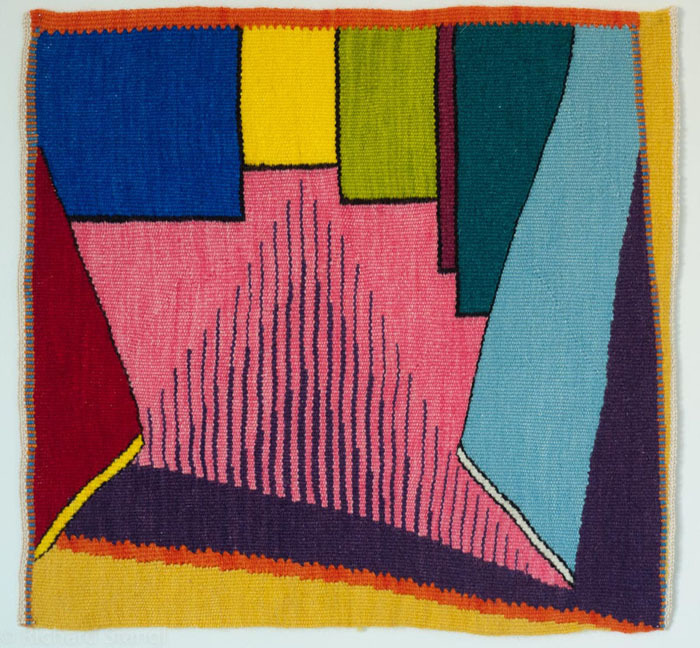 They symbolize the protagonist herself, as well as her story and its relationship to textile practice. My installation, Annunciation (1995), explores the subjective identity of the Virgin Mary.1 The work is a five-panel set of tapestries that hang in a narrow corridor illuminated by candlelight. Opposite the tapestries are a series of brass panels, similar in size to the tapestries. The panels are engraved with words that ask simple questions of identity: “Who am I?” and “Who are you?” The images of drapery in the background are based on my own photographs and pastel drawings. 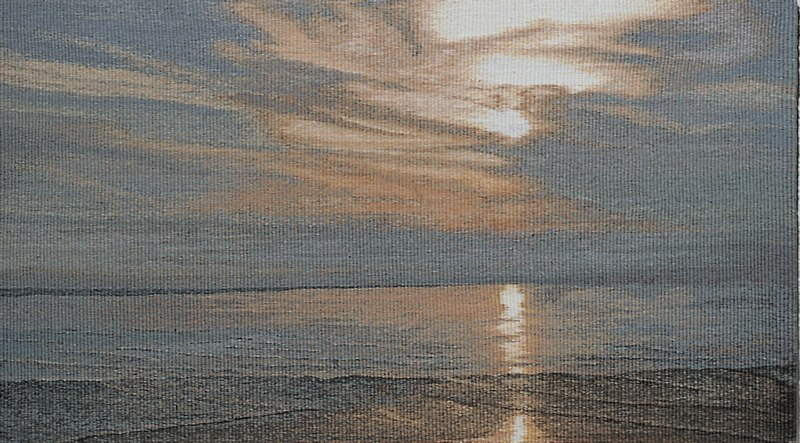 Individual flecks of mercerized cotton create the appearance of an overlying veil of gold. Randomly arranged in the first panel, they become more and more organized until they form an opaque pattern in the fifth panel. Simultaneously, the blue drapery in the background transforms, panel by panel, from deeply shadowed creases to softly hanging folds that reflect the changing emotional state of the young Mary as she loses her individuality and becomes the iconic Mother of God. I have also explored the relationship between Mary and her cousin Elizabeth in two related works: Visitation (1999) and Entre Nous (2000). In each tapestry the background of draped cloth is a quotation from Jacopo Pontormo’s Visitazione (c.1528, San Michele, Carmignano). My Visitation focuses on the section of the painting where the swelling wombs of Mary and Elizabeth touch. Overlying this is a stylized pattern of a pomegranate and a garland of oak leaves, both symbols of Christ and His Passion. Entre Nous is a more intimate work that focuses on the two women themselves and depicts Elizabeth reaching out to embrace her younger cousin in compassion. A thornless rose, a common motif symbolizing Mary’s eternal virginity, appears as a transparent avatar over Elizabeth’s outstretched hand. In The Three Fates (2002), naturally a triptych, I reinterpreted the classic tasks of the sisters as a series of children’s games: Clotho now spins a child’s top, Lachesis plays a game of Cat’s Cradle and Atropos wins at Rock, Paper, Scissors.2 The abstracted background imagery in each panel is derived from the gown worn by one of the sisters in an early 16th Century Flemish tapestry, The Triumph of Death over Chastity, hanging in the Victoria and Albert Museum, London. 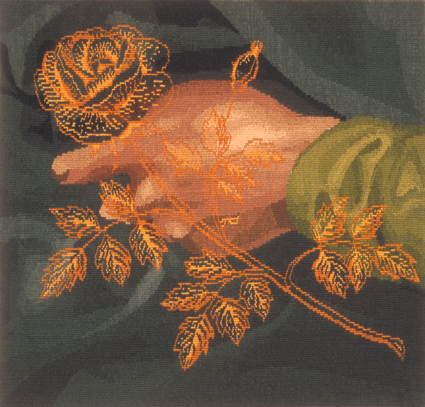 The Lady of Shalott, currently on my loom before its own mirror (May 2008), is based, in part, on the gown the Lady wears in William Maw Egley’s painted Lady of Shalott (1858, Sheffield Galleries and Museums). The abstract background imagery is mirrored two, or three, or four times (depending on how you look at it) and the delineated imagery speaks to her death rather than to her accursed weaving. Arachne and Minerva, Philomela, and The Valkyries await realization both in conception and execution. Others may follow. But, let me not forget Penelope. Homer’s Iliad tells the tale of the Trojan War. Its poetry chants of Paris and Helen, Priam and Agamemnon, Hector and Achilles, Patroclus, Briseis, Andromache, Menelaus and of Odysseus. Odysseus, the King of Ithaca has been at battle in Troy for ten years. His extended return voyage to Ithaca, another decade long in the making, is recounted in Homer’s Odyssey. At home, across the “wine-dark sea,” await his faithful wife and Queen, Penelope, and their growing son, Telemachus. Penelope is beset by a multitude of greedy suitors, each wanting to marry her in order to inherit the kingdom she has so carefully maintained in her husband’s absence. Penelope believes in her heart that Odysseus still lives and so she devises her famous stratagem to delay her seemingly inevitable decision. Her daily weaving and nightly picking back of the shroud for Laërtes is the stuff of legend. To my mind Penelope, through her trickery, delays time from passing in Ithaca during the three successful years of her ruse. Beyond the timeless shores of Ithaca, Odysseus eventually (and eventfully) wends his way back to his kingdom. Upon his arrival, reunited with his wife and son, together they destroy all of Penelope’s suitors and twelve of Penelope’s serving maids. Ithaca is reclaimed for Odysseus. 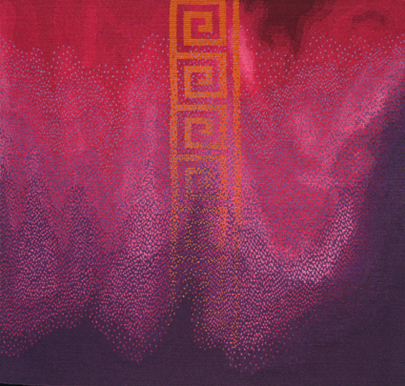 My tapestry, Penelope (2002), incorporates the iconic Greek key design as its woven motif. The golden fret sits central within the width of the weaving, oriented vertically. Fully formed at the top of the tapestry, the pattern disintegrates as it descends to the lower border. The pattern, also known as a meander, becomes a symbol of Odysseus’s convoluted journey back to Ithaca. Each morning Penelope sets out to weave her cloth, praying to the gods that this will be the day Odysseus returns home to her. By nightfall Penelope’s hope wanes and each evening the woven pattern of her cloth dissolves into the darkness of her tears and dreams. Penelope borrows its background imagery from John William Waterhouse’s Penelope and Her Suitors (1912, City of Aberdeen Art Gallery and Museums). Waterhouse has painted a raven-haired Penelope wearing a peplos of cerise-coloured silk (!). I chose the area of the painting where Penelope’s pale arm, upraised, emerges from the shadows of the left sleeve. In a fashion similar to that of the dissolving Greek key motif, the colours of Penelope’s dress are pure and rich at the top of the weaving, but they darken and dissolve into wine-darkness at the lower edge – a woven metaphor for the completion of Penelope’s daily ritual. In Waterhouse’s interpretation of Homer’s narrative, Penelope sits at a loom whose technology is more contemporary to the artist’s own lifetime than to that of ancient Greece. And so, in the painting, Penelope sits at her counterbalanced loom with her back to the windows of the bower through which the suitors entreat her with their gifts and undying expressions of affection. A more historically accurate image would be that of Penelope weaving and unweaving at a warp-weighted loom such as the Valkyries used, though not necessarily so gruesomely dressed as was theirs. The numerous suitors are located on the right side of the canvas. Penelope is central to the composition and two of her serving maids inhabit the left side of the painting. One young maid sits on the floor in front of the loom holding a ball of newly spun yarn. The other maid stands at the back of the room with her two arms outstretched in some task. Penelope, ignoring the pleading suitors, takes her bobbin of weft and breaks the thread with her teeth. This is an astonishingly violent act. As depicted by an eminent Pre-Raphaelite painter one might expect Penelope to take up a pair of delicately engraved embroidery scissors in order to cut the thread. Why has Waterhouse chosen to portray Penelope in such an unladylike fashion? It is because Penelope is not a lady – she is a Goddess, or rather, she is one of three sister Goddesses. Penelope’s serving maid on the floor with the ball of yarn is Clotho, the spinner. The maid standing behind the loom with her arms outstretched is Lachesis, the measurer. Penelope, herself, plays the eldest sister, Atropos, who breaks the thread of life. But whose fate is it that she has decreed? Penelope had been deceived by a household maid who revealed her mistresses’ stratagem to the suitors. Penelope is then forced to finish weaving the shroud for her father-in-law. As she takes the thread between her teeth and snaps it, has she commanded the passing of Laërtes, once King of Ithaca? Or, is hers an act of desperation? The shroud finished, she must now choose one of the suitors. In so doing she must finally acknowledge the death of Odysseus. Not only must she admit to the outside world that Odysseus is no more, but in so doing, she must also admit the defeat of her long fought battle to keep kingdom, home and family together. She must relinquish all she has gained over twenty years to some upstart princeling from a neighbouring kingdom. Must she? Perhaps her ripping of the thread is an act of savage revenge. A goddess can see the future – perhaps Penelope knows that Odysseus will return. With a final pass of the bobbin the cloth is complete. As Penelope tears at the weft she can take delight in sealing the fate of each of the suitors who have for so long assailed her. And, she can also exact her revenge on the deceitful serving maids. Who is this woman at the loom? Goddess? Queen? Faithful wife? One? Or all? Who has she doomed? One? Or all? Not Penelope. She will live forever. It is Penelope, not Odysseus, who will rule Ithaca for the eternity of Homer’s metre.